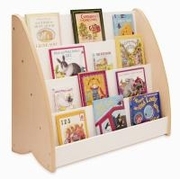 Designed to be placed against a wall, the Newwave Book Display is a one-sided, four-shelf display that works in any classroom. Natural melamine finish. 38"wide x 30" high x 15" deep. 49 lbs. Ready to assemble. FEDEX or UPS Ground. GreenGuard certified. Made in USA. Dimensions: 15in. × 38in. × 30in.